One hazard of my passion for writing is hand issues, especially my thumbs. You see, I prefer writing on my iPhone, not so good for my thumbs, not so good for my eyes either. I’ve had thumb issues for about two years now. I have waited for the right timing to have them evaluated. Today was that day. As I walked into Dr. Tomainos office I was greeted by an incredibly warm and caring staff. Amy is the Nurse Practitioner for Dr Tomaino along with other hats she wears for him. 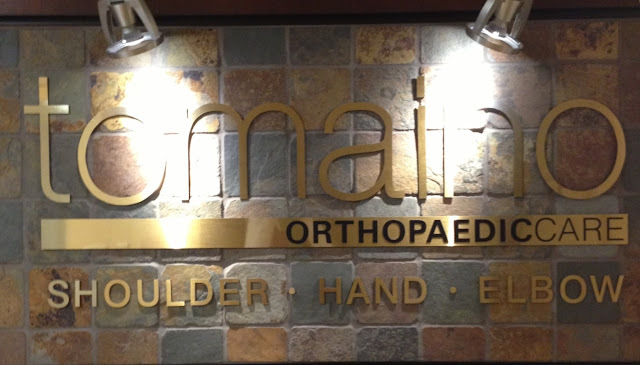 My whole experience today at the office of Dr. Tomaino Orthopedic Care was such a wonderful surprise. A Doctor who truly educates, cares about, and is present to your needs. What an awesome experience to have during a doctors visit! There’s a great doctor in the house …. A Shoulder hand and elbow specialist , with all the technology messing up our joints I recommend keeping his name “Hand”y!!! Living life filled with love awe and wonder….